I have been accepted today for a solo show at Circle Cinema Gallery in Tulsa's only independent, non-profit art house movie theatre. The gallery opening is part of the Kendall Whittier Arts 2nd Thursday Art Walk. 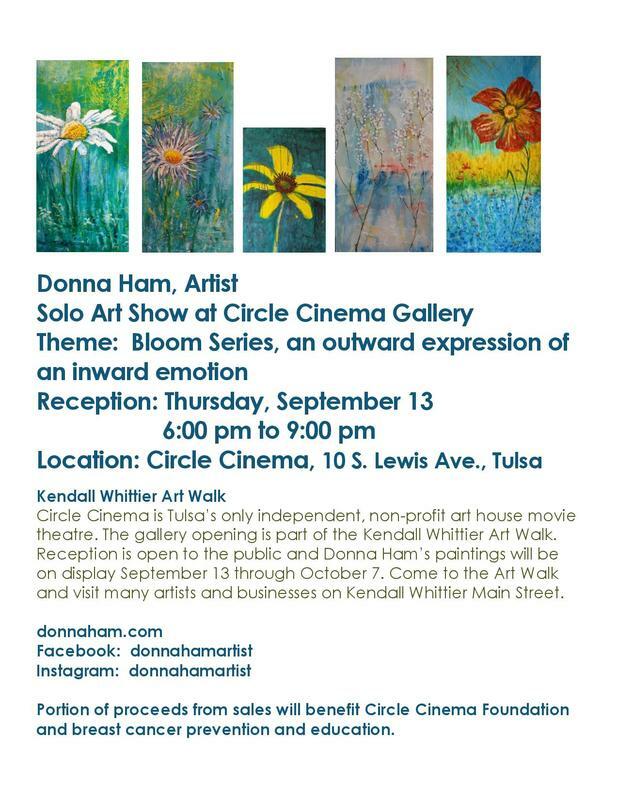 The reception at Circle Cinema Gallery is open to the public on September 13 from 6pm to 9pm and then my paintings will be on display throughout September. My Bloom Series and Summer Series will be highlighted along with many other paintings. Join us for the Art Walk and the reception of my gallery showing. Come to the Art Walk and visit many artists and businesses on Kendall Whittier Main Street. The Circle Cinema is at 10 S. Lewis Avenue. I live in Oklahoma where we have a lot of turbulent storms. This is my interpretation of the excitement, fear and even thrill that builds within me as the air pressure begins to change, the sky turns ominous shades, the air gets threateningly still before the winds pick up, and the rain falls in sheets and swirls in extreme force as the storms intensify I can only express these type of feelings and emotions through abstraction. This is the 5th painting in my Bloom series. I began this journey about this time last year when I was diagnosed with breast cancer. I am celebrating that I am a cancer survivor! The Lord gave me the title of this painting a couple of months ago. I finally decided how to paint this last painting of triumph and victory. After finishing this joyful painting, I awoke at 3:00 a.m. this morning and wrote this poem with the guidance of the Holy Spirit. To the One who truly loves her. "and walk in the way of love, just as Christ loved us and gave himself up for us as a fragrant offering and sacrifice to God." 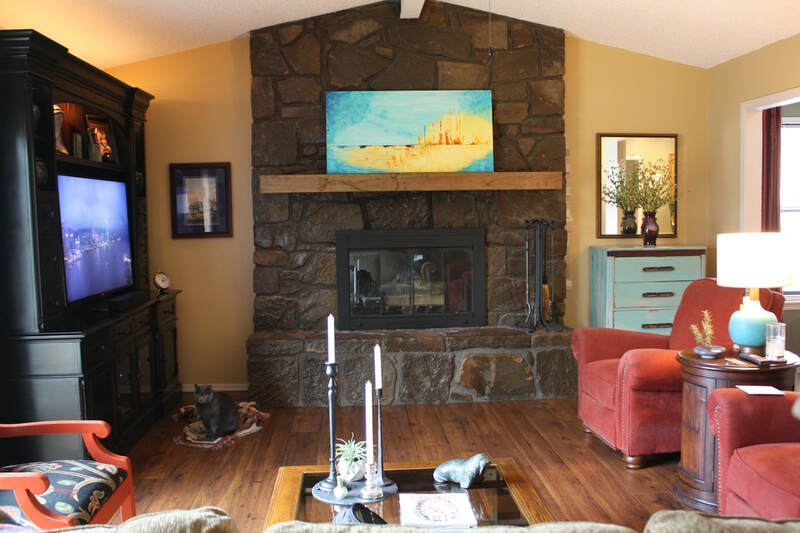 The client requested that I create an abstract painting for her new mantle. I was able to visit her home to get a feel for her general decor and color preferences. We visited and I created an abstract that I hoped would be what she envisioned. I always pray about a painting and God reveals the theme and usually a title. The sunrise theme came from some of my conversations with the client. While I was praying I had a vision about the painting. I kept seeing a beautiful abstract of a sunrise with the sun peeking over the horizon. I saw brilliant yellows and oranges and all shades of blues in the sky above with dark to light as you get to the horizon. The beams of sunlight were in the form of a cross symbolizing the light being the Son of God waking up the day. ​I am blown away. It exceeds my expectations and I feel so honored. You captured what I did not know I wanted and will treasure always. I love it. Perfect!!! I love creating still life paintings and the 30-Day Challenge has been...a challenge! 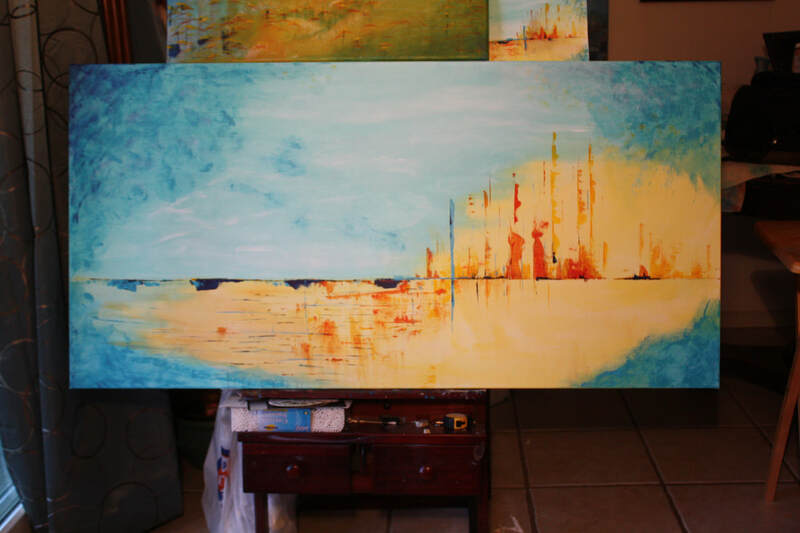 But, I've decided to go back to my first love for a while, large abstract paintings. I think I need a little freedom to express all that is going on in my heart. I bought a 24" x 48" canvas today. Yea! I have a rather large inventory of acrylic paints that are overflowing the plastic tub container. I can't wait to get started with color, glorious color..
A couple of months ago during my morning journaling and devotion time, a new title came into my mind. I quickly wrote it down and now it's time to start the painting to go with that title. Bloom As A Fragrant Offering! This will be the fifth painting in my BLOOM SERIES. 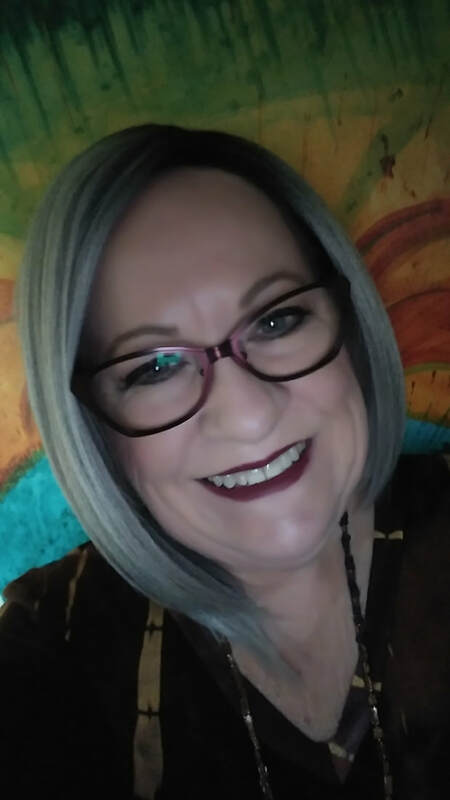 If you've been following my blog posts, you know that the Bloom Series chronicles my journey since being diagnosed with breast cancer early in 2017. I just had my six-month appointment with my doctor and after the first mammogram since all of the radiation. Everything is doing well, but he's ordered an additional ultrasound. I was hoping for a very positive visit but there always seems to be the unspoken "everything is fine, BUT..." statement. After a sleepless night, God has supernaturally freed me of the fear and disappointment thanks to the incredible people in my weekly Charismatic Prayer Meeting and their prayers, love and support. God turned the anxiety into overwhelming JOY! Now, that's a miracle! I didn't now when God gave me such a beautiful title for a painting that it would be for this time. He keeps giving me this incredible gift of JOY today as I prepare to create this brand new painting. I can't think of a better way to celebrate His love for me than to create a painting that will be titled BLOOM AS A FRAGRANT OFFERING! Somehow I think there will be a flower involved, don't you? I am so excited as I wait upon the Lord to fill my heart with the creative interpretation to go with such a beautiful title. I'll post along the way. I hope the journey of this painting blesses you. I'm already blessed! Joyful and Thankful Child of God!!!! 10th painting in 30-day challenge. 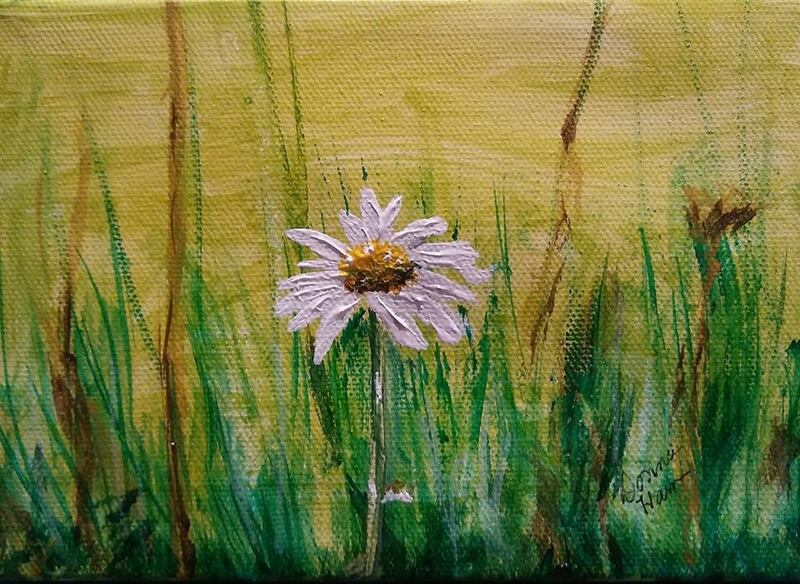 My little painting is 5x7 acrylic on canvas. I am participating in a 30-day challenge with artists from around the world. Today was challenge day #10 to paint a small painting and then "abandon" it in a public location with a note of encouragement for whoever finds it. The painting is based on "A person's life is like grass, it blossoms like wild flowers," Psalm 103:15. My note of encouragement along with the scripture is "If you find this small painting, I pray that your life is filled with joy today and that you find beauty all around you as you are beautiful like a flower, a wonderful creation. I loved this challenge so much! My heart is full of visions of who might find it. How fun!